Tickets should be raised by the user without ever seeing an error code. Now for the final part, create the logger instance and log something. To do this create a controller, give it the name ‘HomeController.cs’ and add this to the class our logger instance. In the next part in this series I will talk about the steps we took to put in place a system that logs every error which happens in the system. Anyone who has ever created a web project in Visual Studio knows that running the debugger can be a long and painful process with apparent lengthy times between starting the debugger and the site finally showing. I have personally experienced recently when working with Orchard. Orchard is a brilliant CMS but if your running it from the original source it contains over 60 projects and whilst some of those are tests the debugger will still takes a long time to run especially on slower PCs. With the introduction of WebMatrix and IIS Express by Microsoft developers where about to turn any folder into a website without the need of having the IIS service installed and running. I’m not going the details of WebMatrix, but if you want to know more there is the official page located here. 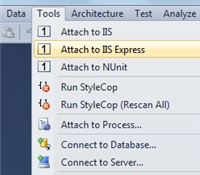 AttachTo is a great little plugging made for Visual Studio 2010/2012 and is used to attach Visual Studio to the IIS or IIS Express process. With two clicks or a custom assigned keyboard shortcut the debugger is attached and with a simple refresh of the webpage the site is hooked in. You can download the extension from the Visual Studio Gallery and get the source from github.